Brion is a small town close to the new urbanisation of Bertamirans, the latter acting as a Satellite town for those working in Santiago de Compostela. 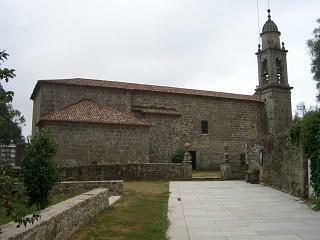 Both towns are located off the AC-453 and are about 10 minutes drive away from Santiago de Compostela. The head office of Turgalicia, the region's primary promoter of tourism, is also on this road although it rarely appears to be open. Right, the church in Brion. Brion has two tourist features, an attractive church set in pleasant grounds and a poorly signposted (and generally tourist neglected) tower that is actually a significant castle ruin perched on a hill above the town. We visited this castle on a dull and partially rainy day when we were stuck for something to do and expected nothing more than a few piles of stones. We were pleasantly surprised. 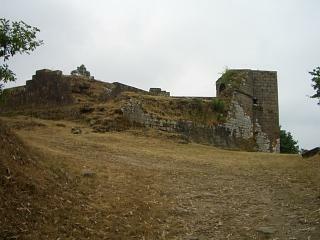 Left, a first view of what our guide book suggested was nothing more than a tower ruin. Finding the castle requires attention to sign posts and there is no real parking to speak of when you finally reach a small sign pointing up to a narrow track. (You can drive up this track, but I would suggest that this be confined to 4 X 4 vehicles with good ground clearance). Once there, the walk takes all of 5 minutes and when you reach the summit you see quite a substantial ruin with a tower, the remains of the old walls, some arches, steps, gable facades, a former water well, plus the addition of some panoramic views. All told this castle ruin would be a significant tourist attraction in the UK or southern Spain, but clearly it has yet to gain the attention of the Galician tourist officials. 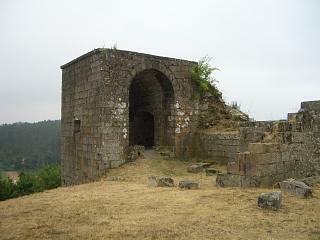 Why I do not know, but possibly because it is so close to Santiago de Compostela with its innumerable monuments. 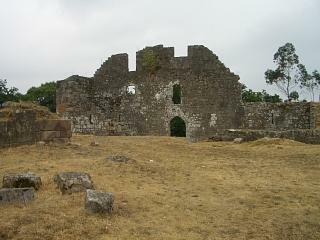 Right, once you examine the ruin it becomes obvious that this was once a large and significant castle. Right, only small section remain intact and this is one of them. It looks over the valley below. You will find that our Hotels in Galicia page has two hotels in Brion, close to Santiago de Compostela.